Media portrays it as something scary/evil. It's made out to be distinctly anti-Christian. Despite a sizable amount of information on the subject, it's somewhat inaccessible, difficult to study, and there's a lot of misinformation. But in reality, it couldn't be simpler. 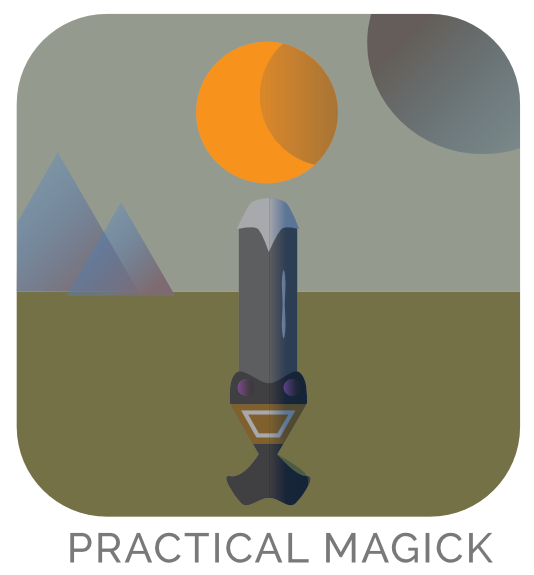 Practical occultism is a tool & perspective that you can employ in your life — even alongside whatever faith you practice. In this post, I'm going to give you the run-down on why practical occultism is something that can serve your perspective, your capabilities, and your life. Though there are many different disciplines that are conflated with or related to occultism, at the center of occultism is a simple perspective that can be applied both inwardly and outwardly. The easiest way to describe this perspective is this: Paying attention to hidden things that have an effect. In other words, reading between the lines. We have physical bodies, yes. But take a moment and consider how much of our experience is entirely non-physical. Thoughts, imagination, emotions, memories — our experience reaches domains that are practically entirely other universes in and of themselves. These universes are hidden, mostly private, yet have dramatic consequences on our lives. While we can use sophisticated measuring tools to examine the physical stuff taking place while we travel these hidden realms (like in the realms of neurology & biochemistry), I think it's fair to say that we all intuitively know that there's a bigger, deeper picture than what physical science is capable of measuring. Our lives and experiences are poetic, as we use colorful & metaphorical language every day that reveals a deeper essence behind our experience. We use far-out there terms to describe events that are rather mundane on the surface, yet somehow we intuit the use of these phrases without consicously recognizing the deeper implications of how we poeticize life. The key is understanding that these hidden realms are not happening in a vacuum. They're intersecting with real life in a way that has impact and effect on our experience. Occultism benefits your sense of vision. You see more of the picture, and you don't skim over what's "obvious." When we frame our life and all of its experiences in the framework of visual poetry, we see an entirely different picture. One that compels us to move, act, and be what we want to be. The visionary understands the importance of vision. They understand that the internal phenomenon that we call "vision" is the gateway of possibility. After all, how can you hit a target that you can't see? Across the spectrum of affairs that happen in life, there are subtleties at work, right under our noses, that are steering the course of our lives' events. Perceiving more of these subtleties means an advancement of perspective–it's like upgrading your mind's processor. In any given occurrence, there is so much more to see and consider. This might seem trivial, but when you're reading between the lines of communications, symbols, decisions you are faced with and what they mean, the impact your thoughts are having on your behavior — you have access to an informed perspective that is taking much more into account. Perceiving subtle complexity is like perceiving all the threads that are tying circumstances together. It's like understanding the moving parts, or hidden architecture of circumstances, events and people. Across the board, all dignified occult practices are aimed toward self-development. Spirit, mind and body are a trinity that all work together — when one suffers, they all suffer. Practical occultists pay attention to the way their diet & exercise influences their physical health and their mood. They understand that time must be taken in order to cleanse & re-center their mind. They understand that all that they do or say is an expression of something greater. For simplicity's sake it's about knowing yourself. and in that self-knowledge is liberation. You don't just understand that you're a divine being in a physical body—you know it and act like it. It's like unchaining yourself from all the perspectives how you should be and act, what you should do and say—and just doing what you know is authentic and real. With self-knowledge comes self-care. You're more in tune with what you actually need and what you don't. Self-care is a vital part of the practice, because your body, your mind and your spirit all have real needs in order to be nourished in order to work to their best ability. You come to value yourself and your creative energy more fully, because you recognize that your creativity is the common link between you and the most powerful forces in the universe. Anything we pursue from the vantage of our vision is creativity. It's simply bringing things into the world, into the field where it can be experienced by others. The Will is the engine of creating positive changes in your life, or using your creative energy effectively. This is what most (rational) occultists are referring to when we say, "magic(k)." The actual practices of occultism are almost all geared toward the purpose of stoking the fires of your Will. Through it, we shape the focus of our attention, the contents of our imagination & vision, and supplying the action to match those visions. Occultism is a neutral philosophy that acknowledges that there are hidden phenomena in our experience that have dramatic impact on our lives. These hidden phenomena are not necessarily supernatural or paranormal—they're everyday things that are common to each person's experience. The practice is like a tool-kit that enables us to get inside and work with these hidden phenomena, rather than be at their mercy. At the end of the day, it's about knowing yourself and choosing an authentic course of happiness. This is illumination, or in the Tarot we'd associate it with XIX The Sun. In coming into happiness, we come out of misery and, simply put, we make the world a better place through transmitting our happiness. Genuine happiness is a radiant force that can really stir things up in an awesome way. Though some dogmas explicitly forbid occultism as a practice, the core of any religious doctrine is deeply enriched by it. The ultimate goals of a practitioner are totally in line with that of any dignified creed that promotes tolerance, respect, love & compassion. Simply put, occultism is a perspective & tool to explore the mystic components of whatever faith you subscribe to. While there are a great many disciplines that fall under the umbrella of occultism and add complexity to this basic synopsis, at the end of the day they're really just different ways to achieve the same goals. You don't need to be a pagan or Hermetic practitioner to be an occultist. Being an occultist is simply attending to the hidden aspects of your life with intention & focus, and working with those hidden aspects to evolve into a (fitter, better) happier version of yourself. I hope that you find the subject worth exploring in your own life! If you feel inclined to take a dip into the waters of the perspective, you are always welcome to schedule a session with me to experience how it may be of benefit to your life.